“I really don’t like this word ‘Indians’,” expresses Siksika elder Rosalin Many Guns. She’s referring to the Calgary Stampede’s Indian Village. It wasn’t just Rosalin that had a distaste for the culturally outdated term ‘Indian’, many others disagreed with it, too. “We gotta’ change it,” said Siksika Nation’s Chief Joe Weaselchild at last years Stampede. And you know what, during the 2018 Calgary Stampede, tipi owners and officials decided that the pleas for a change wouldn’t go unheard. “They officially announced that they named it Elbow River Camp,” says Chrystal Black Horse, a Siksika ladies fancy dancer. “I’m glad we’re getting recognized as niitsitapi, ‘real people’ for Blackfoot, or aboriginal. I’m glad we’re changing, and getting the ‘Indian’ out.” The Calgary Stampede changed it on their website and everything. Gerald Sitting Eagle, Siksika member, elder, and camp advisor, said that the first meeting about changing the name came up about two years ago. Stampede officials and tipi owners sat down together and discussed the possibility for a change. “That name, the Elbow River Camp, came up at the first meeting, and everybody agreed to it. But the Stampede wanted to do it their way, so it took them a while to get it done.” Gerald has frustration in his tone when he talks about Stampede officials. The name ‘Indian Village’ went unchanged for 106 years until now. It stuck for so long because the respect the tipi owners had towards Guy Weadick. Back in 1912, he was the man that got the Calgary Stampede officials to make a special agreement with the government that allowed First Nations people to leave their reserve, and come celebrate their traditions at the Stampede without any legal consequences. This was a huge deal to many because they had the opportunity to go back to Mohkínstsis (the Blackfoot term for ‘elbow’) and connect to the area through ceremony, dance, and intertribal gatherings. This was a triumph at the time, so Guy Weadick’s name stuck: The Indian Village. While it was understandable that this was a common term used a century ago, the term is a cause for confusion in 2018. We aren’t stuck on Christopher Columbus’ geographical screw up – this isn’t India. Here in Southern Alberta, we’re on the traditional plains, foothills, and mountains of the Blackfoot Confederacy, which include the Siksika, Kainai, Tsuut’ina, Stoney Nakoda, and Piikani First Nations. There is a need for indigenous-led workshops about the history and culture of the Mohkínstsis area at the camp. Many visitors come to enlighten themselves on First Nations culture, and the Elbow River Camp has the potential to be abundant with programming to provide true understanding. “I try and get the volunteers that work here to have a workshop on understanding the five different tribes, but nobody’s taking a stand on it. I’ve mentioned it about ten times now, nobody’s listening,” Sitting Eagle insists. So if you (yes, you the reader) have anything in mind, do not hesitate to contact the Calgary Stampede and make suggestions/take action. Other than the name change, the camp had a good year. There was a larger market, daily powwows, and campers showcased their tipi’s and invited the public to walk around inside and view traditional artifacts within. Weather wise, nice and sunny, but one day there was a big wind that caused six tipi’s to fall. But, “while the tipi’s were going down and ripping,” Gerald “noticed that the people in the village really came together and helped.” The camp became a big family during Stampede time yet again. 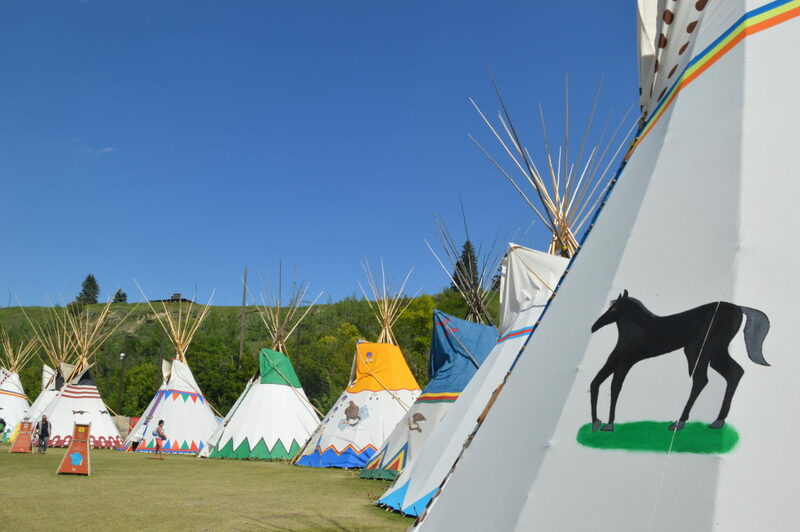 Outside of the Elbow River Camp, the Indian Relay Race was in its second year of exhibition. Representative of the event Ray Champ says that they’re developing a new partnership with the Stampede, and thinks the event’s a good match with the rodeo. I asked Ray to explain the process of the relay race. The exchange is the most critical part – the smoother you can be, the faster you can be, the better your chances of winning the race. It takes a lot of teamwork, talent, and respect for horses. The relay racers adorn their horses, too. They brush colourful paintings onto their coats and leave saddles, harnesses, and tassels to the wayside. It’s cool to see. The Calgary Stampede has definitely created more spaces for First Nation exchange of knowledge and culture. They had the Indian Relay Race, DJ Shub and The North Sound were indigenous artists that played on the Coca-Cola Stage, and the name change to Elbow River Camp – all positive steps. They’re taking their tagline to heart, and are still working hard to be ‘the greatest outdoor show on earth’.